Construction - Heller Industrial Parks, Inc. Through careful planning in the site selection, design and construction process, Heller has developed the ultimate site for your company's unique distribution center needs. 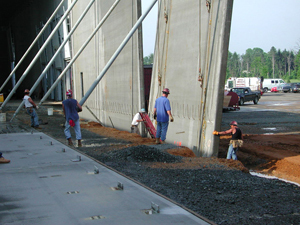 Heller's distribution center design features on-site constructed reinforced concrete panels. These architecturally handsome buildings require no maintenance and are virtually impossible to damage from heavy industrial use. Another benefit of Heller's innovative design is energy efficiency. Walls are built as insulated "sandwich" panels, surpassing mandated energy code requirements. This results in a tighter building which is impervious to air infiltration, thereby maximizing energy efficiency. Our newest distribution centers provide 40-foot clear ceilings which permit higher storage than conventionally designed buildings. Consequently, our distribution centers give you more volume per square foot leased. This allows greater storage capacity at a lower cost. Because we consider our buildings to be long-term investments, we will not compromise on quality, design, or construction. We closely supervise all construction, so that the highest levels of craftsmanship are achieved. We do our own general contracting, and we do it well. This allows us to save money on construction, which in turn, lets you save money on rent. Heller's solid financial bottom line provides our clients with peace of mind. You can rest assured that we always reinvest our capital in order to maintain the quality of your building. Our buildings' clear height and Early Suppression Fast Response (ESFR) sprinkler systems make it possible to store products in racks to a height of 35 feet to top of product without the need for costly, in-rack sprinklers. Therefore, you get more storage space per square foot and better protection for your productâ€”all at a lower cost. Most of our buildings also provide 8-foot, 6-inch wide by 9-foot, 8-inch high truck doors with 30,000-pound mechanical dock levelers, bay spacing for optimum pallet rack configuration, 60-foot concrete aprons, a 30-year roof system, ample car and trailer parking, and well-designed offices. "We take pride in our ability to overcome seemingly insurmountable obstacles in order to fulfill our customers' needs."